The Quality Hôtel Menton Méditerranée welcomes guests from February 16th to March 3rd 2019 to celebrate the 86th Lemon Festival just a stone's throw from our hotel. Check out the theme of this year's festival, its schedule and the surprises in store for you. The entire team at our 3* hotel can't wait to meet you! The 86th festival's theme: "Fantastic worlds"
The Lemon Festival, a.k.a. Menton Carnival, was founded in 1934 to attract people to central Menton in winter. As the biggest lemon producer in France, the town naturally decided to showcase its prize fruit by creating real citrus sculptures. 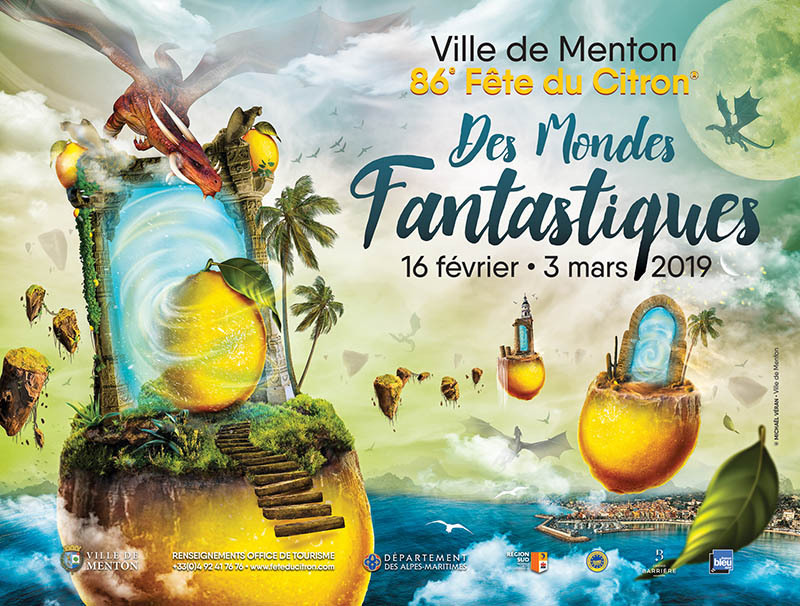 February 16th to March 3rd 2019 plays host to the 86th Lemon Festival on the theme of "Fantastic worlds". Imaginary creatures and magical worlds bring the Golden Fruit parades to life. Tickets are now available for you to book on the official online shop. 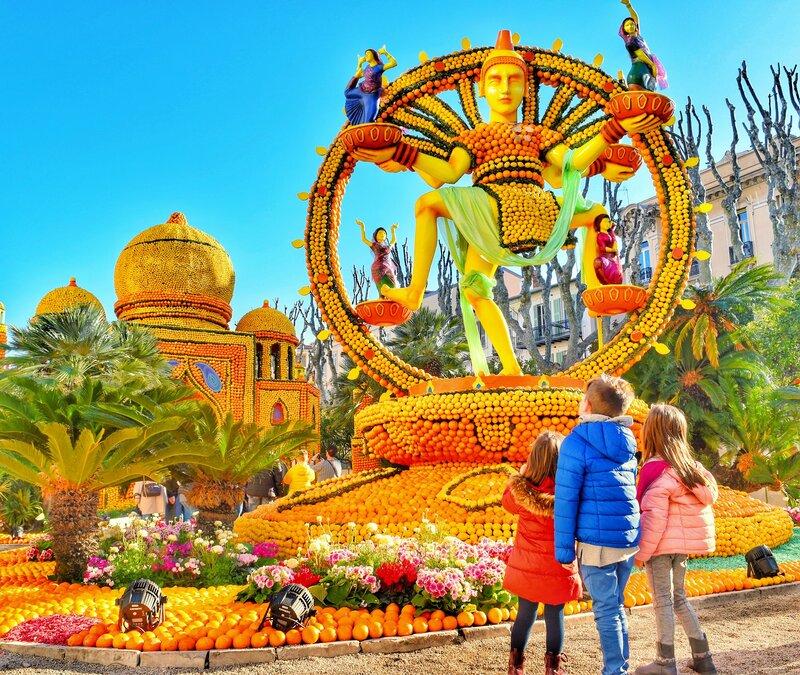 Feast your eyes on 10 amazing floats and 13 displays in Biovès Park, just minutes from the Quality Hôtel Menton Méditerranée, during this one-of-a-kind family event! The Lemon Festival schedule is packed with exciting and fairytale sights that kids and adults love. The Gardens of Lights are held in Biovès Park and the Golden Fruit and Evening corsos on the Promenade du Soleil. Check out other things to do on-site such as a trip to the Lemon grove, Craft Fair or Orchid Festival. The central Quality Hôtel Menton Méditerranée is in the heart of the action just a 2 minute walk from Biovès Park and close to the Promenade du Soleil. To celebrate the event, the whole team at our 3* hotel are in fancy dress to imbue you with the carnival atmosphere. There's a photo booth set up especially next to a big head from the Carnival. Share your best shots on Instagram with the hashtag #feteducitron and tag @hotelmentonmed. Come and celebrate this one-of-a-kind three week event in our hotel! The Nice Carnival, another must-do event on the Côte d’Azur, is on at the same time. The staff at 5 other hotels in the Summer Hotel Group also get involved in the festivities with a fancy dress reception: Best Western Plus Hôtel Masséna Nice, Best Western Plus Hôtel Brice Garden Nice, Best Western Hôtel New York Nice, Hôtel Florence Nice and Ibis Styles Menton Centre. Book your stay at the Quality Hôtel Menton Méditerranée now to get the best rate and be in the heart of the action during the 86th Lemon Festival.